“Zidane is a myth,” said former France coach Raymond Domenech. “A myth capable of setting off emotions in people, and not only positive ones.” Domenech’s assessment of a player many would consider an archetypal legend, a player generally thought of as France’s greatest, might appear less sensationalistic than would be expected. But, in many ways, it was Zidane’s unique, unconventional form of greatness that made him stand out above the rest. There always was an intrigue about Zidane. His introverted but unflappable demeanour, his assured elegance on the ball, his blessings and his curses combined to form a player whose talent was almost hypnotic. To watch Zidane was to watch a theatrical display of immaculate ball control. And for all his grace, there have been few players that have possessed such a powerful and accurate shot. Domenech’s suggestion that Zidane is something of a deity in human form is perhaps not an exaggeration. His multitudinous accolades, his abundance of trophies even, pale in comparison when considering the enjoyment and pleasure he gave those that watched him in action, especially France supporters. Zidane’s success on the international stage was unquestionable. The enigmatic playmaker was the fulcrum of the country’s most successful national team, instrumental in midfield as France won the World Cup in 1998, the European Championships in 2000, and their march to the World Cup final in 2006. “In France, everybody realized that God exists and that he is in the French international team,” said former teammate Thierry Henry. There is little argument to dispute Zidane’s status as France’s greatest when considering his impact when it mattered most. His two goals against Brazil in the 1998 World Cup final were enough to earn him the man of the match and Player of the Tournament awards. 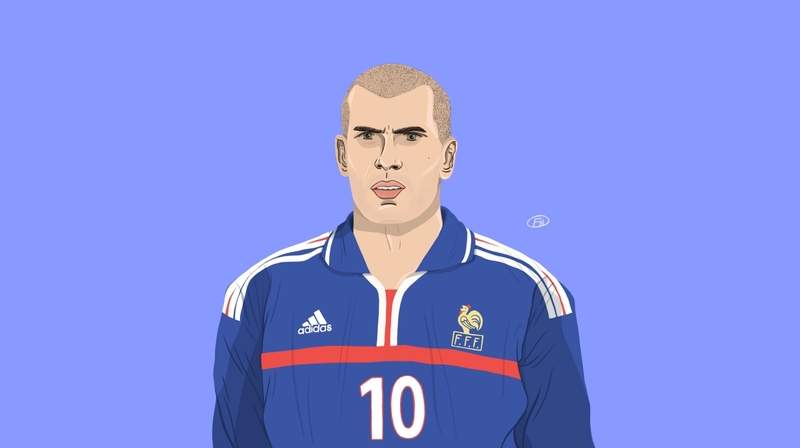 A superb free-kick in the quarter-final of Euro 2000 two years later, and then the winning golden goal in the semi-final, saw Zidane again crowned Player of the Tournament. And in 2006, despite his notorious petulance in the final, his impact prior to defeat against Italy brought with it yet further recognition. Zidane’s club career was less controversial but no less successful. In moving to Real Madrid from Juventus in 2001, he became the then most expensive player of all time, signing for £42 million. And despite his reserved, dignified approach, Zidane’s quiet authority was no less prevalent at the Bernabéu. He became a bonafide Galáctico, but not in the traditional sense. His spectacular volley in the 2001 Champions League final was the highlight of a career-defining five-year spell with Los Blancos. Before that, Zidane had excelled with Bordeaux in his homeland and Juventus in Italy. By the time the Spanish giants came calling, he had already been named World Player of the Year with the Bianconeri and secured two Scudetti. By the end of his lucrative career, Zidane had won three World Player of the Year awards in addition to three further, less successful, nominations. What set Zidane apart from the competition, from the so many talented players in the history of his famous footballing nation, was his unerring consistency. Showmanship came with functionality. Rarely was a mistake made or an opportunity surpassed. Amongst the quiet composure, the air of authoritative control on the ball, there was never arrogance, only self-confidence and intelligence.